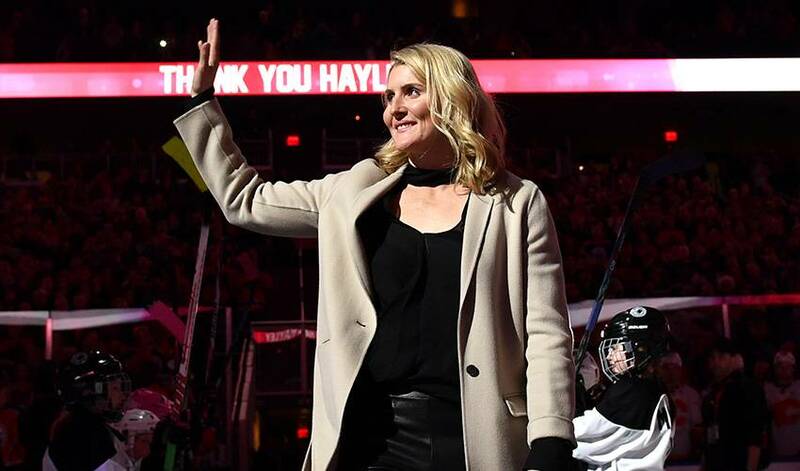 Hayley Wickenheiser continues to see participation grow for her female hockey festival. Now with the backing of the NHL and the NHL Players' Association, it's looking to reach a wider audience. The NHL and NHLPA are sharing their support for the Canadian Tire Wickenheiser World Female Hockey Festival, which began in Calgary on Thursday. The event, also called WickFest, was created in 2010 by Wickenheiser, a four-time Olympic gold medalist with Canada's women's hockey team. For Wickenheiser, the League and NHLPA support is invaluable. "It gives us a much wider reach in what we're trying to do in growing the female game and exposing to as many girls around the world as possible," said Wickenheiser, who is also assistant director of player development for the Toronto Maple Leafs. "Also, the credibility of being attached to the NHL is very valuable for us. We have a really good understanding in how to develop and grow the female game and the NHL wants to do more in that capacity, so I think we make good partners." Wickenheiser said 47 teams participated in the first event in Burnaby, British Columbia, after the 2010 Vancouver Olympics. This year, there will be 110 teams at the event in Calgary. Besides the games, there are also development clinics, including sessions on mental training, fitness, education and nutrition. "I think it aligns very heavily with what both the PA and the League are doing through the IGF (Industry Growth Fund)," NHLPA manager of special projects Rob Zepp said, "which during the last round of negotiations was agreed upon and implemented in the CBA, with its sole focus being to grow the game, to grow our sport, and allow more families and kids to connect with our game, the players and the clubs. "With WickFest being the massive festival that it is, having the ability and opportunity to connect with so many female hockey players and their families is just a great opportunity for us." The Stanley Cup will be at the festival on Friday. Former NHL forward Bryan Smolinski and current NHL referee Wes McCauley also will attend. "At WickFest, we're going to have a strong presence," NHL vice president of IGF initiatives Rob Knesaurek said. "We're bringing alumni, we're bringing the Stanley Cup, we've brought in some referees to help keep young ladies engaged in hockey and other channels to stay involved. We'll have coaching clinics to teach them how to stay connected to the game and what they can do after their playing career. We're truly vested in this and hoping it's the start of something even bigger."